Jo S: It’s my 'Big Week' with a crate full of my favourites all making their way around again and a few shiny new ones to brighten up that first dark few days of the year. Hotly anticipated in my ‘faves’ pile will be Hawkeye #14. Kelly Thompson is my current hero of choice; this series hasn’t missed a beat throughout and the previous instalment, pushing together Clint Barton and Kate Bishop and then watching with glee as the two sparred and sparked, managed to take it up a notch further. I’ll also be indulging my taste for Thompson with Rogue & Gambit #1 in the hopes that she can give the same magic twist to characters I’m less familiar with. Next up, no sooner have I been grumbling about how the first Phoenix Resurrection: The Return Of Jean Grey contained no Phoenix and no Jean Grey than - whoosh, kaboom! - here’s the second issue, hopefully with all the red-headed flamey drama I’ve been looking forward to. Also nominated in the category ‘Most anticipated issue #2’ is Cynthia Von Buhl’s Minky Woodcock: The Girl Who Handcuffed Houdini; as an erstwhile amateur magician’s assistant, this tale blending the history of Conan Doyle and Houdini with a detective mystery is right up my street. Van Buhl’s burlesque style dares to bare, and the combination of detective noir, feisty girl hero and sceptical approach to mysticism and magic makes this an intoxicating mix for me. The second part of Ed Piskor’s history of the X-Men arrives this week: the first was fascinating in its detail and yet managed to be a captivating story at the same time so I’ll make time to delve into X-Men: Grand Design #2 even though it’s back to work this week. I’m doing a bit of homework too in preparation for the incoming Black Panther movie; Rise Of The Black Panther sounds like a good place to start so I’ll take that too this week. January is the darkest time of the year but I’m planning to keep it warm and well lit with comics! Andy H: After the 'possible' excesses of New Year's Eve I may need to ease my way into 2018 with a little 'lighter' reading. It looks like my pull-list is playing ball as it's a nice gentle start to the year. Obviously, first off the blocks is Batman: White Knight #4. I know I'm repeating myself but, wow, Sean Murphy's art is awesome! The story continues to hit all the right notes as the role reversal tale throws the world of Batman and Jack Napier into a whole new dynamic. Great fun. Walking Dead #175 could be a game changer in this long running zombie fest. I dip in and out of the series but the 'New World Order' storyline looks set to shake things up a bit. Hawkeye writer Kelly Thompson takes on the mutants as Rogue & Gambit #1 reunites this ex-X-couple. 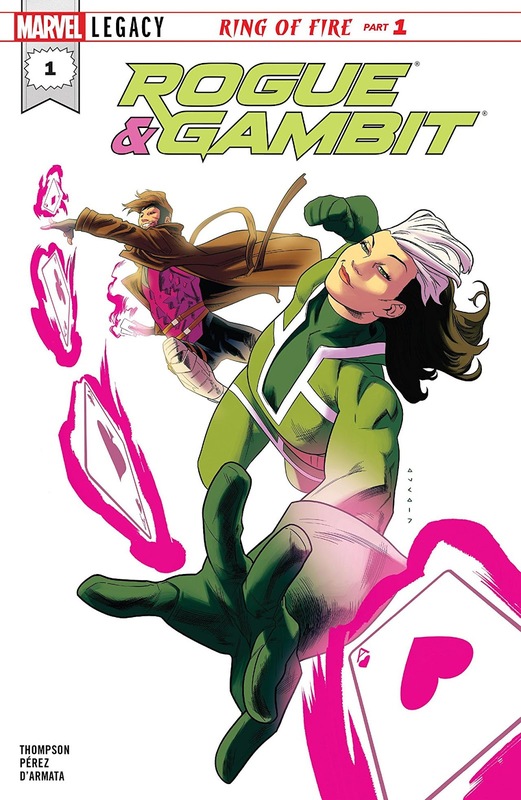 Both Rogue and Gambit haven't quite been at the top of their game for some years so I hope this miniseries and Thompson's deft handling will, at last, raise their profile once again. More X-stuff in the shape of Phoenix Resurrection #2 as the weekly miniseries cracks on at a fair pace. The first issue did enough to grab my attention and nostalgia did the rest. I've missed Jean Grey so want to be here to welcome her back. Finally, and best 'til last for me, I kick off the year with Giant Days #34. This title just gets better (and it was already great!). The cast of characters are well rounded, fun to be around and not a cape in sight. Happy New Year!